The nine painters is an exhibition featuring multiple painters, including Sean Cummings, Mali Morris and Michael Simpson. The Nine Painters is an exhibition featuring an eclectic range of paintings with varying mediums from oil, to tar. The white wall gallery space is complimented by the large greenhouse roof, and delicious fireplaces, adding character and originality to the work. The exhibition consists of two floors enforcing an artistic journey as you follow the paintings into the corridor and up the stairs. the use of shadow, deceives the viewers eye to create a three dimensional perspective. 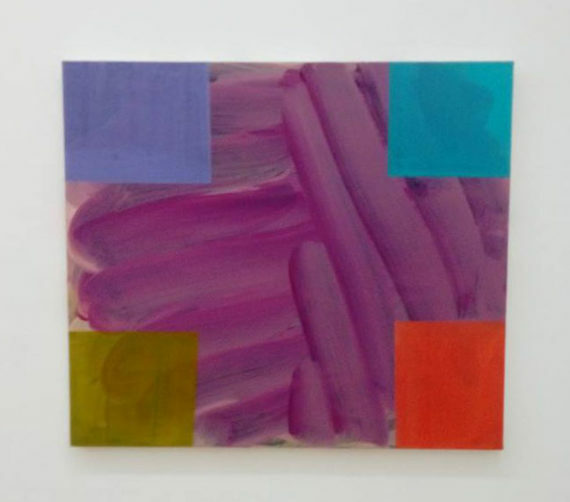 The contrast of the monochromatic interior of the room, and the bright vibrant painting, was similar to the work she recently exhibited in the John Moore Painting prize. The review for the award stated that her work is “tight, precise and controlled”. This description is clearly a repeating factor throughout her work as she follows similar rules and patterns. Her work overwhelms the senses and creates a deceived understanding. The use of an intrinsic colour pallet creates a natural, earthy aesthetic bringing attention to the dissimilarity of nature and geometrics. Within her work, it is clear that neither the foreground or the background are more important. They are both supportive each other and balance both the perspective and composition. 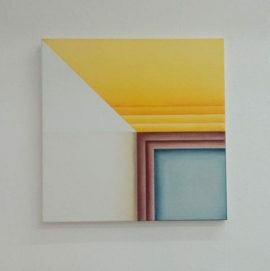 Parlour uses similar compositions to the artist Tomma Abts, who also influenced by the simplification of the world creating a minimalistic, geometric, colourful painting. In the main room, you are immediately greeted with a bright, bold, intrusion of colour situated on the far right wall. The artist Mali Morris explores abstract painting by, “building complex layer of pictorial space” . This particular piece is presented on a rectangular canvas accentuating the four corners with opaque, coloured, squares. The intensity of the almost luminous colours, compared with the expressive, figurative brush strokes adds a sense of urgency and movement. The slightly darker area of the gallery space is illuminated by the work highlighting the influence and power of colour. The framing squares create balance and order to the otherwise chaotic application of paint. The opacity of the paint signifies that the paint has been mixed with water to allow the background to filter through an opaque film of colour. Morris has clearly used a combination of mixed and pre-mixed acrylic paints due to the varying hues and tones of each colour. Mali Morris’ work immediately grabs your attention and pulls you into the gallery space. Eleanor Bartletts ‘Untitled’ 2009, is almost missed as you walk up the stairway as it almost cowers into the wall. The small scale canvas paintings are made using older canvas and oil paints, adding an aged texture and colour. Bartlett’s aim is to create work exploring the relationship of form and materials. The use of attentive brush strokes symbolises the natural and also allusiveness of the world around us. Other pieces in this collection are made using industrial materials, including tar where she feels that the materials beauty is often overlooked. Tar is thought to be an ‘industrial beauty suggesting toil and endurance’, therefore incorporating this into her work, she automatically adds strength and power providing the viewer with confidence. The clear markings on the canvas emphasise an old to new, rustic attraction, similar to the paintings downstairs. The blending of the old, distressed staircase and the natural browns and creams of the paint encourages it more to be overlooked and unseen as if it were ‘part of the furniture’. A faint marking of the number eight on the side of the canvas would often be overlooked, however, due to the nature of the instalment, it is presented in all its glory and clearly visible. This hints at a spectrum of loss and concealment; adding a sad, unloved feel to it. Many wouldn’t see this piece, but for that reason, it is the more special. In conclusion, I found this exhibition really inspiring. You can really understand the diverse, yet homely feeling towards this exhibition. The merging of such multifarious practices has created a tornado of excellence spanning from bright, exuberant colours, to fluid, figurative brush strokes: merging to create drama and exclusive, manipulated excitement. The location adds character and exclusivity. Magazine- Art Monthly. Issue: Dec-Jan. Issue no: 402. Magazine Art News. Volume: 116. Issue: Spring.